Who knew granola was so easy to make at home? Sprinkle this low-fat version over yogurt, fresh fruit or both! In this recipe, rolled oats are mixed with crispy coconut flakes and chopped Medjool dates for a golden, toasty granola that's not too sweet. A pinch of curry powder adds unexpected flavor and warmth. For a different take, try replacing the dates with chopped dried apricots, dried cherries, or pieces of dried mango. Stir in half a cup of chopped nuts to the oats for added protein. You'll be snacking on this addictive sweet-savory mix all day long! The coconut oil is optional. For the calorie-conscious, skip it altogether, as the coconut flakes are rich enough. Alternatively, use olive oil instead for less coconut flavor. For extra-golden granola, toss the oil with the maple syrup and dates before stirring into the oats. Per Serving: 155 calories; 7g fat; 23.5g carbohydrates; 2g protein; 0mg cholesterol; 4mg sodium. This granola was different than anything I've ever tried, but it was really good. I added extra dates and syrup so that they'd be extra golden and clump nicely. This curry-spiced granola is to die for! So sweet and savory. It was really quick to make and is perfect for breakfast or a snack. 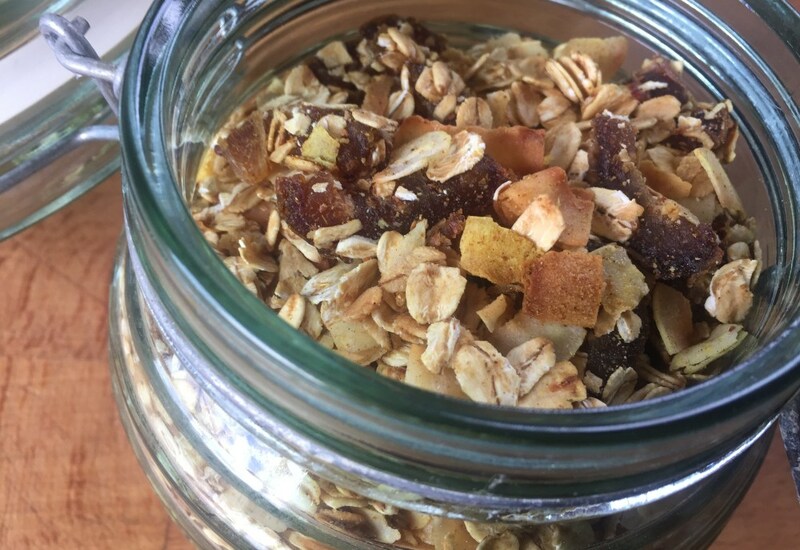 This granola is a hit with the kids for their school snack. Took a while to get used to the curry flavor but now its a regular request from them.